I bought the 4707PH5 Temic Tuner from Halted in the hopes of building a Spectrum Analyzer with it. I was able to get it to tune from 50 - 850 Mhz and produce a nice clean 36.125 Mhz IF. 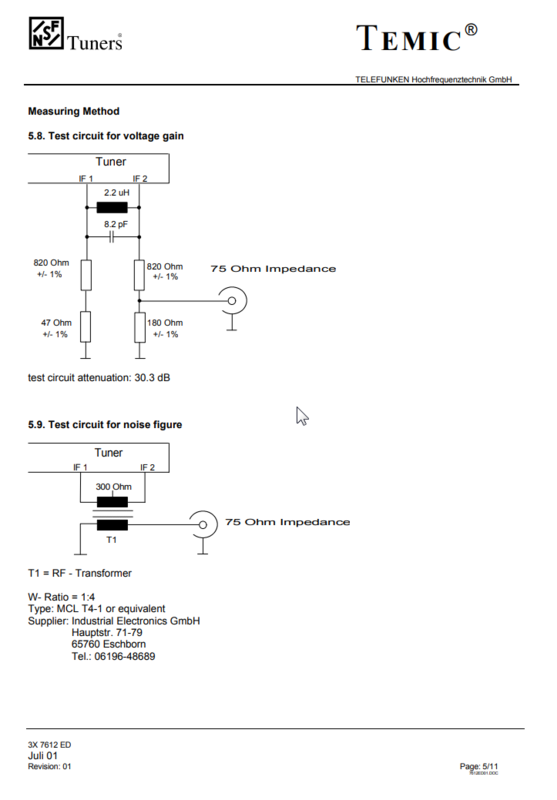 However, there is a part of the datasheet that relates to output impedance that I'm confused about. With reference to schematic 5.9 below, it appears that the transformer with a impedance ratio of 4:1, should present an output impedance of 300 (75 * 4) ohms to the differential outputs IF1 and IF2. This would mean each output has an output impedance of 150 Ohms. However, if I plug this value into schematic 5.8 and ignore the LC circuit which is resonant at 37.5 Mhz, I'm unable to understand how the output is attenuated by 30.3 db because the 75 || 180 is about 53 ohms and 53/(150+820+53) is 0.05 or -25.7 db. Yes, the discrepancy isn't that big but I wanted to be sure my thinking was correct. Many thanks to radiolistener who corrected my misreading of the transformer impedance ratio which I have now Edited and Corrected. transformer MCL T4-1 has impedance ratio 4:1 and turns ratio 2:1. Good Point radiolistener, I mistakenly assumed the turns ratio was 4:1 but the number on the datasheet is the impedance ratio as you correctly indicate. Thanks for that. However, ironically, this increases the discrepancy of my calculation! I now should have an output attenuation of 53/(150+820+53) which is -25.7db vs the listed -30.3dB. Careful with terminology -- the port impedance may be very different from the expected load impedance. A typical case being open-collector outputs, which are quite high impedance (kohms) with a little capacitance, and that's about it. The expected load might be whatever, but the impedance is high. Or the opposite direction (low Z) for voltage followers, of course. The maximum power transfer theorem, for example, still applies as ever, but only while linear -- you will indeed get maximum gain into a high (kohms) load in such a case (collector output), but the power handling will be minuscule. In this kind of case, the match is instead chosen for maximum power, or bandwidth, and the impedance is dealt with however it must be dealt with. Often, this is by placing a load/termination resistor there, so the source is reasonably Norton-equivalent and you can use your usual filter prototypes with it. Or if more power gain is desired, then a one-port-open filter prototype must be used. Put another way: the voltage gain (or corresponding power gain) may be correct for the resistor values shown, but need not be correct for other resistor values, even though the same resistor ratio is used. If the port impedance is not specified (or something equivalent, like s22), you probably have to measure it to be sure. Or, of course, stick to the prescribed methods and values, and, perhaps, buffer/amplify it at your earliest convenience to get the impedance into something reasonable and expected? Or, put still another way: I don't know. (Helpful, right?...) But, I can give this background, which can allow you to figure it out with a little analysis. For example, if the change from balun to resistor divider gives 30dBV insertion loss*, then you should be able to calculate backwards and figure out the output port impedance, because one way it's loaded with 300 ohms and has X gain, and the other way it's loaded with ~1.7kohms and a divider and has X - 30dB gain. Thanks Tim, that helped a lot. I mustered up the courage to look inside the tuner can and found that it uses a Philips TDA5736. The data sheet indicates the IF amplifier has a Zo of 67 ohms in series with 20nh of inductance. It also has an emitter follower (which you had suggested it might) in its output stage. Your tip on reducing the gain by 1/2 (6dB) was also useful and correct. Of course, I didn't trace the pcb so I can't say if the IF output of the IC is actually the final output stage but given the accuracy of your loss calculation I'm inclined to go for it. I'll also play around with a transformer and see if I can experimentally deduce my own value of Zo. The 30.3dB circuit attenuation mentioned on 5.8. of the data sheet that you had posted is absolutely right........there is just a small error in your calculation, that's all. 180//75 ohms is 52.9 ohms as you rightly point out. 20 log (0.030) is exactly -30.3 as the data sheet says.